Novak Djokovic of Serbia shakes hands after defeating Roger Federer of Switzerland in the men’s singles final at Wimbledon in July. The best rivalry in professional men’s1 tennis history continues to unfold — and it isn’t Roger Federer against Rafael Nadal. It’s Federer against Novak Djokovic. Federer and Nadal are probably the best players of all time.2 They may have played the best match of all time. But their head-to-head history is mostly predictable and one-sided. It’s better than nearly every rivalry that came before it, yet it’s not even in the top two current matchups. Nadal’s rivalry with Djokovic, the current world No. 1, is much better. Nadal and Djokovic have met 42 times, more than any other pair since the sport went pro in 1968, according to data provided by Jeff Sackmann of Tennis Abstract. From September 2010 through June of this year, Nadal and Djokovic have played a remarkable 21 times,3 including in seven major finals, and have contested several classics. But they’ve also played many duds. And while their overall record is nearly even, the rivalry breaks down into several lopsided sub-rivalries: Nadal dominates on clay (14-4), Djokovic on hard (14-7). Nadal won 14 of their first 18 matches; Djokovic has won 15 of 24 since. Compare that to the running feud that is Federer vs. Djokovic. They have been playing close matches since their first meeting after Djokovic’s 20th birthday, when Djokovic won in a winner-take-all third-set tiebreaker. Since then, neither man has won more than three of the matches between them in a row. They’ve been even on every surface: 1-1 on grass, with Federer holding narrow leads of 4-3 on clay and 14-13 on hard courts. Djokovic is 6-4 in finals, Federer 11-10 in semis. They’ve split their 12 Grand Slam matches. They could meet for a 37th time in the World Tour Finals, the year-end event featuring the tour’s best players that ends Sunday in London. These are three of the sport’s greatest rivalries ever, and they remain very much alive, with the three participants currently holding the three top spots in the rankings. The continuing drama of these rivalries owes to the greatness of the trio, the happy coincidence that Nadal and Djokovic were born a year apart and the stubbornness of Federer, sticking around at age 33 to keep challenging his younger rivals. Federer-Djokovic provides plenty of intangible pleasure for neutral fans. Each can defend but prefers to play the aggressor, making for quick reversals and for many unpredictable points. Federer has one of the sport’s most effective serves ever. It has a mighty foil in Djokovic’s possibly best-ever return. Federer’s rekindling of his love for the serve-and-volley raises the tension. Many of their matches have been meaningful and memorable: Federer’s French Open win to break Djokovic’s 43-match winning streak in 2011 was bookended by two Djokovic wins in U.S. Open five-set semifinals after saving match points in 2010 and 2011. Their final this July at Wimbledon was about as high in quality and excitement as Nadal’s more celebrated win over Federer at Wimbledon in 2008. The Federer-Djokovic relationship has occasionally been tense; last July Djokovic’s father criticized Federer’s character. Other external figures keep the rivalry interesting: Djokovic coach Boris Becker and Federer coach Stefan Edberg are former world No. 1s who played each other 35 times. The statistical side of ranking a sport’s best rivalries is necessarily arbitrary. There is no single, universally accepted way to assess matchups, but here is what we can safely look for in a great rivalry: Frequent, competitive matches in significant situations. Just as the world’s best player probably isn’t best at every shot but must be really good at each one, the Federer-Djokovic rivalry doesn’t rule each category but it’s strong in all of them. Nadal-Djokovic is the most common meeting among men’s tour players since 1968. Federer-Djokovic ties for second; its next edition will push it past Ivan Lendl-John McEnroe. Nadal-Federer ranks eighth. 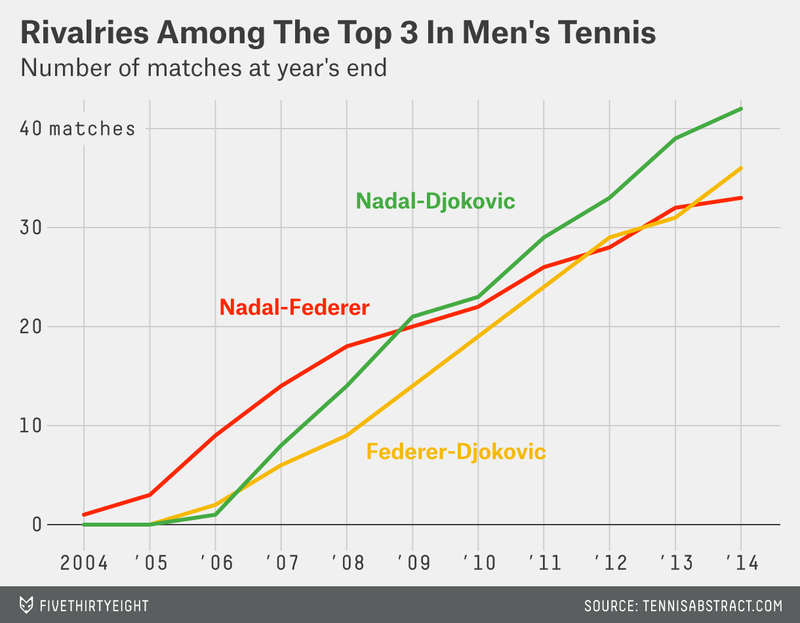 Fedal, as fans call it,4 ranks higher for total significance of matches. Of their 33 meetings, 20 have come in finals — double the number of Federer-Djokovic finals. He’s right, but you have to win semis to reach finals. 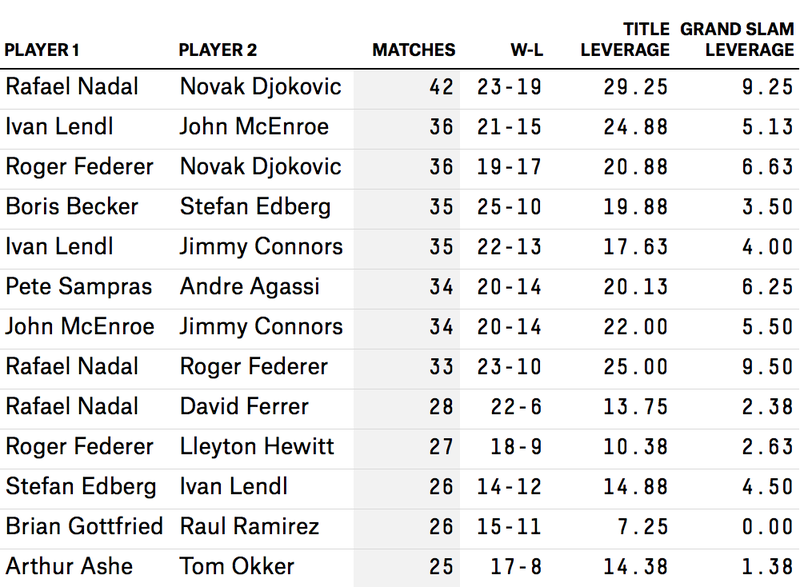 I came up with a quick way to assess the importance of matches in winning titles, which I call title leverage.5 By this measure, Nadal-Djokovic ranks first in title leverage overall, and second at Grand Slams. Nadal-Federer is second in title leverage, and first at Grand Slams. Federer-Djokovic ranks sixth and third, respectively. The rivalry is unusually even. Djokovic, who trails in the head-to-head, has won 47.2 percent of their matches. That’s the highest winning percentage for the man who’s trailing in any rivalry with at least 25 matches. They rarely leave any tennis unplayed. 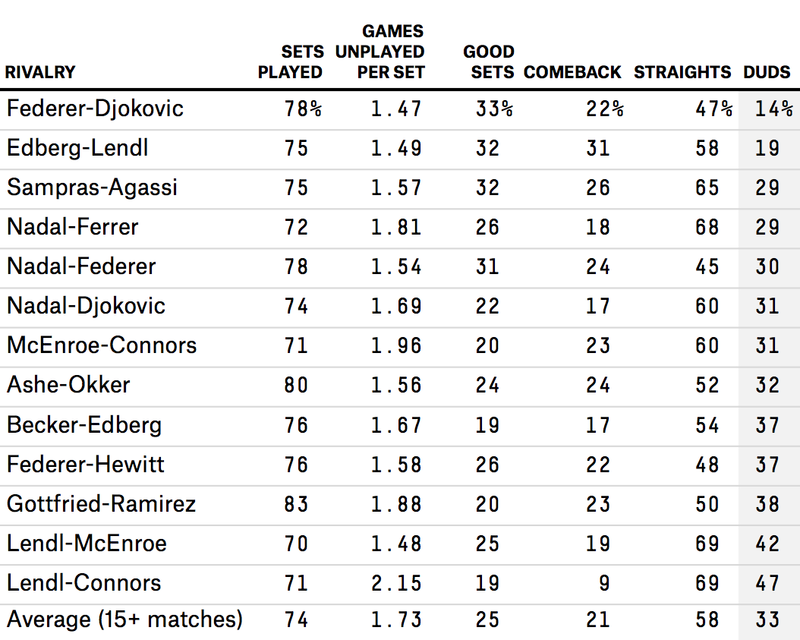 They’ve played 77.6 percent of possible sets in their matches.6 That’s above average for rivalries with at least 15 matchups,7 better than Nadal-Djokovic and behind only Nadal-Federer, by a nose, among rivalries with at least 27 meetings. They play very few duds. Just 47 percent of their matches have ended in straight sets, below the average rate of 58 percent and below the level for Nadal-Djokovic, though just above the 45 percent for Nadal-Federer. And just 14 percent of Federer-Djokovic matches have been what I call duds: straight-setters without a set 7-5 or closer. The rate is at least 30 percent for the two Nadal rivalries, and averages 33 percent overall for frequent matchups. No amount of evidence will trump taste for most tennis fans. They might appreciate a matchup for the personalities, for the aesthetic joy of watching one player’s backhand volley against another’s forehand passing shot. Or they might adopt a favorite in their hearts, not in their minds, after a single memorable match. As much as I enjoy Federer-Djokovic, and especially was gripped while attending their Wimbledon final this year, I had more fun watching two players ranked outside the Top 100 playing a late-night five-setter in the third round of the 2009 U.S. Open. The players themselves use their own criteria for ranking rivalries. In women’s tennis, Chris Evert and Martina Navratilova played each other 80 times, including in 60 finals. A whole article, or book, could be written about what that means. In tennis as in other sports, the level of play keeps rising as competitors get bigger, fitter and stronger, so the two dominant players of the last decade likely are the best ever. In relative measures, such as dominance of their peers, major titles and consistency, Federer and Nadal also stand up well to the likes of Pete Sampras and Rod Laver. More than all but 24 other pairs of players who have played each other throughout their careers since 1968. Since Nadal has dominated the rivalry, his name probably should come first, but that doesn’t lend itself to as pithy a nickname. Naderer? A final counts as one, a semi as one-half — since winning a semi gives you a chance to play a final — a quarterfinal as one-fourth and a round-of-16 match as one-eighth. If they finish a best-of-five-set match in four sets, they’ve played 80 percent of possible sets. The average figure is 75 percent. Unless otherwise noted, the averages in this section are among matchups with at least 15 meetings since the professional era began. If the loser of the set won five or more games, I counted that as leaving no games on the table. So I counted a 7-5 set and a 7-6 set the same, as leaving no games. A 6-4 set left one possible game, a 6-3 set two, and so on. Federer-Djokovic has averaged 1.47 games, compared to an average figure for rivalries of at least 15 matches of 1.73. The smaller the figure, the closer the sets. The average is 25 percent for rivalries with at least 15 meetings. Matches are considered comebacks only if they occur in completed matches; walkovers, retirements and defaults aren’t included. Federer won as high a percentage of his matches against those five as Nadal has won against him.